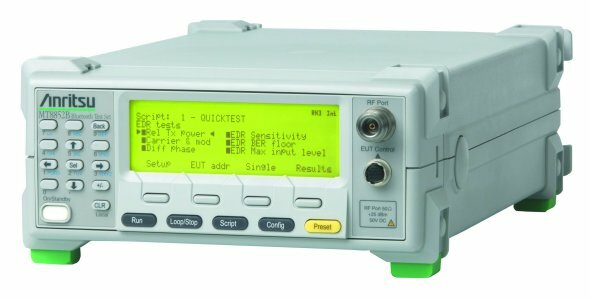 The Anritsu MT8852B is an optimized radio layer test instrument used for verification, design proving and production testing of a broad range of equipment that integrates Bluetooth technology. Normally used in large scale manufacturing environments, it is a productive solution when testing phones, digital cameras, headsets, computers, audio-visual, gaming devices and modules. This is a quality Bluetooth Test Set that can productively ensure products are performing accurately before they are released to the market. Unlike the predecessor model MT8852A, the Anritsu MT8852B Test Set supports 6 Bluetooth EDR and 8 Bluetooth Basic Rate transmitter and receiver test cases. There are many supported EDR test cases including: Differential Phase Encoding, Sensitivity, BER Floor Performance, Maximum Input Level, Carrier Frequency, Relative Transmit Power, and Stability and Modulation Accuracy. The MT8852B’s advanced technology also adds the new EDR measurements to the existing scripts so that users can test EDR chips with a single press of the RUN key on the instrument. It is also an excellent solution for audio measurement, as it has advanced audio testing capability up to three Synchronous Connection Oriented (SCO) audio channels with CVSD, u-Law and A-Law codec air interfaces. The connectors for both analog inputs and outputs for all three audio channels are located in the Rear-panel. There is also an (AFH) Adaptive Frequency Hopping option that will facilitate the analyzing the co existence and interference of such signals as WLAN. This optionally provides displays of masked channels and FER graphically when testing interfering signals. In high-volume production environments, its capabilities are well known and provide factories with higher production rapid testing in combination with greater levels of accuracy. 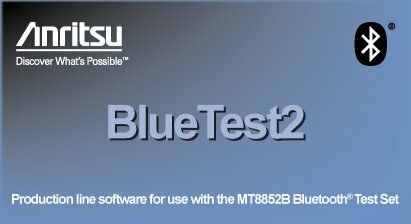 One of the ways this is achieved is by use of Blue Test2 software which is supplied as a standard with the MT8852B. This software through the GPIB interface provides remote means to control and run Bluetooth test on up to 16 MT8852B Bluetooth Test Sets concurrently. Users can edit the Blue Test2 software code if need be to fit into their specific requirements. The results of the test can be stored to database on a separate computer or in local drive for further analysis or future reference. Fault-finding software called Blue SuitePro3 that interfaces to the MT8852B Bluetooth Test Set through GPIB interface can be used to offer greater insight into the device performance. View A short video explaining how to use the Anritsu MT8852B test set and the MX885203A low energy software to perform Bluetooth low energy tests. The MT8852B Bluetooth Test Set has a 8DPSK and π4-DQPSK signal generator and modulation analyzer. These usually are applied in early stages of development to test the device without forming any protocol connection to the test and also for a full support of both (π/4DQPSK – 2Mbps) and (8DPSK – 3Mbps ) data rates. The MT8852B Bluetooth Test Set is compliant with Bluetooth core specifications and the measurements are performed as defined in the Bluetooth SIG for RF Test measurements. The introduction of the new Bluetooth low energy specification and the ability to control test devices through USB and UART HCI control ports makes MT8852B Bluetooth Test Set an excellent solution when testing Bluetooth enabled products. If you need one of these units at a nice price please contact us. This entry was posted in Site News and tagged Anritsu MT8852B. Bookmark the permalink.